The 7th use of R in Official Statistics conference is the event for all things R in the production and use of government statistics. The 7th installment of this conference will take place from 20 to 21 May 2019 at the National Institute of Statistics in Bucharest, Romania. We are very proud to announce that we have two excellent keynote speakers. Julie Josse will talk about her work on theory and tools related to imputation and inference in the presence of missing data. Giulio Barcaroli will talk about 12 years of using R at ISTAT, the Italian Statistical Office. The conference is preceded by three tutorials on Data Cleaning, Statistical Disclosure Control and Optimal Sampling Stratification. You can now register by following instructions here. Most vignettes are built when a package is built, but there are occasions where you just want to include a pdf. For example when you want to include a paper. Of course there is a package supporting this, but in this post I will show you how to do it yourself with ease. If you do not already have it, create the vignettes folder in your package directory. Put your static pdf there. Let's call it mypaper.pdf for now. Create a .Rnw file with the following content. This repo contains an example. The option fitpaper=true is necessary because the Sweave package that is included when the vignette is built somehow causes the pages to rescale if it is not included. If you post your package to CRAN, myfile.pdf will be deleted from the directory so it is not part of a binary download. The uRos2018 conference is aimed at professionals and academics who are involved in producing or consuming official (government) statistics. We are happy to announce that we recently posted the full program of the 6th international conference on the use of R in official Statistics (uRos2018) on our website. Alina Matei, professor of statistics at the University of Neuchatel and maintainer of the sampling package. One session devoted to the results of a two-day unconf that is held prior to the conference. Two journals will devote a special topic to the conference. All the abstracts will be published online soon. Follow us on twitter for the latest news and updates! Version 0.9.5.1 of stringdist is on CRAN. The main new feature, with a huge thanks to our awesome new contributor Chris Muir, is that we made it easy to call stringdist functionality from your package's C or C++ code. Add the #include <stringdist_api> to your C/C++ source file. Start using stringdist from C! Great! how can I learn more? The full API is desribed in a pdf file that is generated from doxygen that comes with the package. You can find it by typing ?stringdist_api on the R command line. A few fixes, and a couple of long-deprecated function arguments have finally been removed. Check out the NEWS file on CRAN for a complete overview. Examples of applying R in statistical production. Examples of applying R in dissemination of statistics (visualisation, apps, reporting). Analyses of big data and/or application of machine learning for official statistics. Implementations of statistical methodology in the areas of sampling, editing, modelling and estimation, or disclosure control. Organisational and technical aspects of introducing R to the statistical office. We are very happy to announce that we confirmed two fantastic keynote speakers. Alina Matei is a professor of statistics at the University of Neuchatel and maintainer of the important sampling package. Jeroen Ooms is a postdoc at UC Berkeley, author of many infrastructural R packages and maintainer of R and Rtools for Windows. The call for abstracts is open until 31 May. You can contribute to the conference by proposing a 20-minute talk, or a 3-hour tutorial. Also, authors have the opportunity to submit a paper for one of the two journals that will devote a special issue to the conference. Read all about it over here. This data is dirty with missings and full of errors. Let us do some imputations with simputation. Ok, cool, we know all that. But what if you'd like to know what value was imputed with which method? That's where the lumberjack comes in. The lumberjack operator is a `pipe' operator that allows you to track changes in data. So, to track changes we only need to switch from %>% to %>>% and add the start_log() and dump_log() function calls in the data pipeline. (to be sure: it works with any function, not only with simputation). The package is on CRAN now, and please see the introductory vignette for more examples and ways to customize it. There are many ways to track changes in data. That is why the lumberjack is completely extensible. The package comes with a few loggers, but users or package authors are invited to write their own. Please see the extending lumberjack vignette for instructions. You can get started with the introductory vignette or even just use the lumberjack operator %>>% as a (close) replacement of the %>% operator. As always, I am open to suggestions and comments. Either through the packages github page. 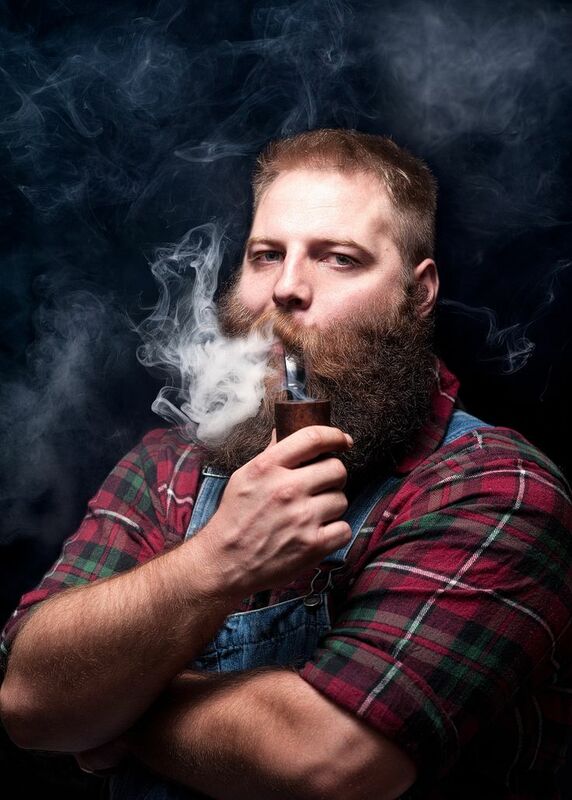 Also, I will be talking at useR2017 about the simputation package, but I will sneak in a bit of lumberjack as well :p.
And finally, here's a picture of a lumberjack smoking a pipe. It really should be called a function composition operator, but potetoes/potatoes. all fitting in the magrittr not-a-pipeline. To start with an example, let us first create a data set with some missings. Below, we first impute Sepal.Width and Sepal.Length by regression on Petal.Width and Species. After this we impute Species using a decision tree model (CART) using every other variable as a predictor (including the ones just imputed). The package is pretty lenient against failure of imputation. For example, if one of the predictors is missing, fields just remain unimputed and if one of the models cannot be fitted, only a warning is issued (not shown here). So here, the third Sepal.Length value could not be imputed since the predictor Sepal.Width is missing. It is possible to split data into groups before estimating the imputation model and predicting missing values. There are two ways. The first is to use the | operator to specify grouping variables. # Sepal.Width, computing a model for each Species. Note: by using group_by, we also transformed the data.frame to a tibble, which not only sounds funny when you pronounce it (tibble, TIBBLE, tibble? tibbebbebbebble) but is also pretty useful. The parts in square brackets are optional. Please see the package vignette for more examples and details, or ?simputation::impute_ for an overview of all imputation functions. stringdist 0.9.4.2 was accepted on CRAN at the end of last week. This release just fixes a few bugs affecting the stringdistmatrix function, when called with a single argument. Actually the last bug has not bitten anyone since it was masked by the second one 🙂 (it was reported and fixed a long time ago but popped up again after fixing the second bug -- hat tip to Hadley for testthat!). The second fix also ensures that stringdist's memory allocator for q-gram storage is called fewer times which yields a speed gain in computation of q-gram based distances. A new version of the validate package for data validation was just accepted on CRAN and will be available on all mirrors in a few days. Also, it is now possible to return a logical, even when the result is NA, by passing the na.value option. A complete list of changes and bugfixes can be found in the NEWS file. Below I include changes in 1.4 since I did not write about it before. I will be talking about this package at the upcoming useR!2016 event, so join me if you're interested!